The CUL copy of Domizio Calderini, Commentarii in Juvenalem [Venice : Printer of Domitius Calderinus, 1476-77] (Inc.3.B.3.152; ISTC ic00035000) is now fully catalogued on line. The book is inscribed “Antonij Seripandi et amicoru[m]” on leaf k6 recto, a clear indication of its provenance from the library of Antonio Seripandi (for whom see “A book from Parrhasius’s library” posted on 11 May 2010). 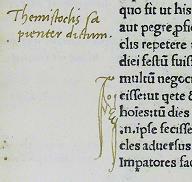 It also bears some notabilia in Seripandi’s hand on leaves d5 verso and d6 recto. Unlike in the 1477 Plutarch’s Problemata, Seripandi does not states that the book was previously in the library of Aulo Giano Parrasio. 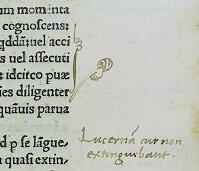 An isolated marginal note on leaf a2 recto in a different cursive hand, apparently earlier than Seripandi’s notabilia, may or may not be by Parrasio. The book could possibly be identified with number “617. Calderinus Veronensis” in the 1521 post-mortem inventory of Parrhasius’s library (see Caterina Tristano, “La biblioteca di un umanista calabrese, Aulo Giano Parrasio”, Manziana (Rome), [1988 ? ], p. 303). The question whether the book belonged to Parrasio remains open. Giovan Paolo Parisio (1470-1522) of Cosenza, better known as Aulus Janus Parrhasius, was a famous humanist from Calabria (Italy). He taught in Milan, Venice, Naples and Rome and was in contact with the most influencial intellectuals and litterati of his time, such as Giovanni Pontano, Jacopo Sannazaro, Luigi Tansillo, Girolamo Carbone, Vittorino Barzizza, and the Greek exiles Janus Lascaris and Demetrios Chalcondyles, the father of his wife Theodora. He put together a celebrated library including manuscripts discovered by him at Bobbio in 1493. 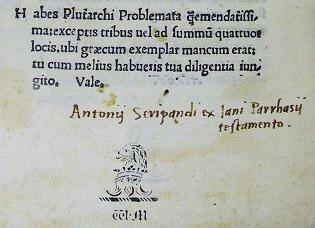 At his death, he bequeathed his books and manuscripts to his friend Antonio Seripando (1486-1531). 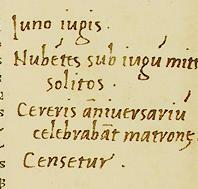 Parrhasius’s library was already so well known during his life time that in December 1521, when Seripando rushed to Cosenza after hearing of Aulus’s death, he already found losses among the books listed in the inventory hastily compiled by the notary Francesco of Salerno at the request of the widow. At Seripando’s death in 1531 his books passed on to his brother, Cardinal Girolamo Seripando, who in turn gave his entire library to the Augustinian convent of San Giovanni a Carbonara at Naples in 1536. From then on what remained of Parrhasius’s library shared the destiny of the convent library, declared “Royal Library” by royal decree of King Ferdinand IV of Naples on 27 August 1792, and incorporated into the Borbone Library after the political and social unrests of 1799. However, in the time intervened between Cardinal Seripando’s bequest and the royal decree of 1792, the convent library was predated of precious manuscripts and books on several occasions. In some instances manuscripts and books were actually sold by the monks themselves. Many of them can now be found in libraries around the world, including the Vatican Library and the national libraries in London, Paris and Vienna. A copy of Plutarch’s Problemata, printed at Venice by Dominicus Siliprandus around 1477, was one of Parrhasius’s incunables. Removed from the Augustinian library at an unknown date, it is now held by Cambridge University Library [Inc.5.B.3.33, Oates 1786]. The book is inscribed “Antonij Seripandi ex Iani Parrhasij testamento” on leaf h10 verso, and it is possibly identifiable with “no. 549. Plutarcii moralia translata” in the 1521 post-mortem inventory of Parrhasius’s library (see Caterina Tristano, “La biblioteca di un umanista calabrese, Aulo Giano Parrasio”, Manziana (Rome), [1988 ? ], p. 275, no. 549). On 8th September 1837 the book was sold in London by the auctioneer Benjamin Wheatley, who died sometimes afterwards between September and December d. 1837. It later belonged to William Milton (1820-1882) of Exeter College, Oxford, before being bought by Francis Jenkinson, who presented it to the University Library in 1908.
notabilia, nota signs and maniculae.